← A big bear sighting! What is Solunar and why is it helpful? The solunar theory is a hypothesis that animals and fishes move according to the location of the moon in comparison to their bodies. The theory was laid out in 1926 by John Alden Knight, but was said to be used by hunters and fishermen long before the time it was published. In May 1926, John Aldenn Knight put together some fishing folklore and other fishing factors such as the sun and the moon, hence the name Solunar (Sol for sun and Lunar for moon) to form a theory on the patterns of animal movement. Knight compiled a list of factors which control or influence the day-to-day behavior of many freshwater and saltwater fish. Each one of the 33 different factors were considered. All but 3 were rejected. The three factors retained were the sun, the moon and the tide. For salt water fishing, tides have long been known as a factor which control fishes’ behavior. As Knight’s research progressed, he found that rather than just tides themselves, the relationship of the moon and sun’s positions relative to each other may be the determining factor. 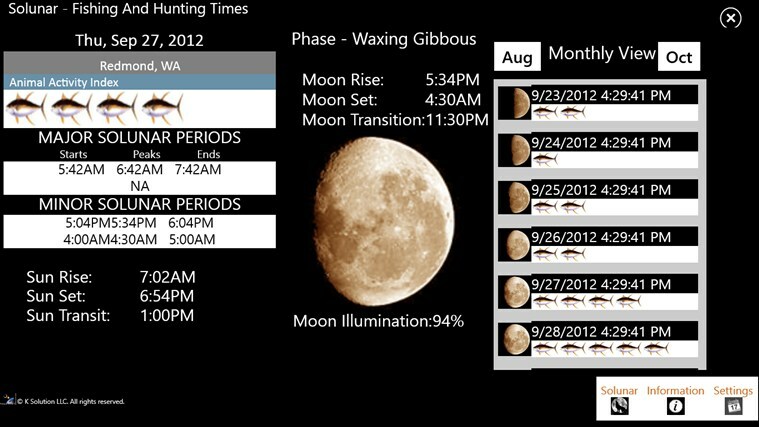 In addition to the time of moon up (moonrise) – moon down, his research determined that there were intermediate times of the day that occurred in between the two major periods. From that he establishes that there were major periods (moon up – moon down) and minor periods. Knight published the first Solunar table in 1936. Solunar tables are tables that fishermen and hunters use to determine the best days of the month and times of the day for catching fish and hunting game. For fishermen, the tides, sunrise and sunset are helpful times of the day to know when the fish are going to bite. For hunters, the tides are not a factor. Using these tables, a fishermen and a hunter can tell when the moon is directly underfoot and overhead. The strongest activity occurs when there is a full moon or a new moon and is weakest when there is a quarter moon and a three quarter moon. This is because the moon and the sun’s gravitation force is strongest when directly above or directly below our head. The lunar data humans receive is better now because of the newer technology the US Naval Observatory and GPS technology. This new technology has allowed the Solunar Theory to generate hunting and fishing times with much greater precision It is important to note that data in tables found on various websites should be reverified periodically with US Naval Observatory available data as well as compared against other reputable solunar data providers. Inconsistencies abound due to the complex nature of the Astrophysics computations and overlooked associated anomalies checking that are required to produce useful results. Moon Transits which do not occur for more than a day or associated times being off more than a few minutes are indications of a fundamental issue for a given position and should be suspect. All data providers should be verified before assuming data presented is authoritative or accurate.